Intro from Jay Allison: Below are four “pilot episodes” for Chelsea Merz’s BOOKCASES series. I’d also urge you to listen to the little excerpts from Chelsea’s work for Allston-Brighton Free Radio. They’re only a couple of minutes long, but each one contains something memorable. They are also testimony to this fact about radio: You can have an idea and do it. No money, no decent equipment, no national distribution, no excuses. This was such a reassuring notion – especially accompanied by a tape with lots of good things on it – that we actually began an unofficial Transom.org/Atlantic Public Media Artist-in-Residence program because of it. Chelsea has been staying in this little cottage we rented and she’s using our gear and collaboration to make her own work. She’s also helping us with ours. So far so good. Her new project idea is called “Bookcases” and she’ll describe it below. It’s one of those ideas that could be a life’s work if you let it. Have a listen to the pilot pieces and come discuss them with us. We’ve also included some excerpts from Chelsea’s recent work at Allston-Brighton Free Radio, just little 2-minute bits, but they’re definitely worth your time. Chelsea recorded everything on a greenish-yellow mini-disk recorder and her microphone is a shiny plastic Karaoke deal from Radio Shack. You do what you can with what you’ve got. I’ve been collecting portraits of people by asking them questions about books on their bookshelves. I stumbled upon this concept last summer while looking at my own bookcase. My mother moved from Santa Monica to Boston and I have temporarily inherited her books. My bookcase now resembles the bookcase of my youth. And all these books, books that I haven’t really seen or paid attention to in years evoke so many memories and stories. To gaze at those shelves, well it’s much more moving and revealing than looking through a family photo album. Since I’ve been doing these interviews I’m hooked. I want to interview everyone. If Yo Yo Ma asked you to pony up you'd do it. This interview, with veterinarian Al Estock, is from a longer piece on pets and how people anthropomorphize them. This excerpt is from a longer piece on Boston’s first Automatic Public Toilet. It took a lot of time and energy to get an interview with the Mayor’s office and when we showed up they were mildly disappointed. They thought we were from NPR. But as soon as we started talking toilets the mood changed and they gave us a really good interview. We did this piece the week Timothy McVeigh was executed. Do inmates get their final meal request? Can anyone really eat any food at all, hours before being executed? To answer these questions and others we spoke with Larry Fitzgerald of the Texas Department of Criminal Justice in Huntsville, TX. I grew up in Chicago and spent a good part of my life listening to WBEZ and WFMT. Of course I didn't know this. As a kid the presence of radio was something I took for granted, much like all the other things I took for granted: a dog, Encyclopedias, my parents' amazing record collection. I also had these great recordings of old radio shows, shows like "Bob and Ray," "The Whistler" and "Our Miss Brooks." I just never fully realized that all of this was radio. One year my grandmother sent me a General Electric tape recorder. It had a beautiful microphone with the GE logo embossed on it. I made radio dramas using cooking trays, aluminum foil and water to simulate thunderstorms and car crashes. But I got older and forgot about it all. In school I majored in film. At my first production class the Professor said "films show, plays tell." My heart just sank. Telling was a big deal and I couldn't decide which to commit to: showing or telling. What hadn't occurred to me is that radio does both. Anyhow, I ended up getting another major in English. Since then I've been a secretary writing unpublished novels. But I have always loved the radio. Last February, with my two friends Alice Smythe and Eilis O'Riley, I joined Allston-Brighton Free Radio, a community radio station in Allston, MA. Each week we alternated editing the audio, which we did directly on our minidisk, and writing scripts. Sometimes our producer would send us out on assignment: Noam Chomsky lectures, political debates, etc. But most of the time we were left to our own devices. If we were desperate we'd visit Bluemountain.com and look up all the peculiar holidays that now exist. Doing so inspired some of our stories: "Adopt a Shelter Animal Month," Noise Pollution Awareness Day," and "Kill Your Television Week." How did I end up here, at Transom? I was laid off in July so I spent a lot of my time working on radio stories. In September I sent Jay Allison a tape. We started an email correspondence and I ended up here where I've been working on these Bookcase stories. This topic is for talking about Chelsea Merzs BOOKCASES idea. There are four pilot episodes — the Show Page link is above. Feel free to comment on these pieces and make suggestions for more. Id also urge you to listen to the little excerpts from Chelseas work for Allston-Brighton Free Radio. Theyre only a couple of minutes long, but each one contains something memorable. They are also testimony to this fact about radio: You can have an idea and do it. No money, no decent equipment, no national distribution, no excuses. The work of Chelsea Merz is wonderful inspiration. Bookcases is a great idea — perhaps the best I’ve ever heard. Chelsea Merz and Transom, you’ve made my day. Maybe even my week. Chelsea is a terrific fresh breeze. I loved hearing her come on the air (temporarily hoarse) during the local fundraiser, honest and funny about the shoe-string circumstances and enthusiastic. It’s great that you found eachother. The energy is resonating. I identified with the man who still considers himself part of the equation as a reader as opposed to being a big time writer, and am grateful that you didn’t push him into looking pathetic. Listening to your work, I figure "yeah I could do something like that," AND "yeah, the world is quite all right just as it is, Chelsea and the others are providing good programs and I can just take care of all the other things I need to do. Life will still be decent if I don’t finish X to get to Y radio thing." Both ways there’s a compliment in there for you. aside from the microphone noise, these pieces were great (if you have $100, the Sony stereo mic is a good way to collect quality sound for the minidisk). i loved the "liveness" of this work, not a fake "live" sound, scripted and read. you have a knack for keeping radio intimate and getting people to confess, tell great stories (shown and told). no easy feat. of course the pieces lured me over to my own bookshelves. fondled a few books, pulled one off the shelf, watched as a little school photo floated from between pages. it was from 30 years ago…faded writing on the back… my girlfriend’s first boyfriend! your pieces made me think about what’s special about my bookshelves. i thought about what it takes to combine collections when you get together with someone. there are some books we still, after 10 years, insist on maintaining duplicate copies. by the way, i enjoyed the veternarian’s story about the formally dressed cat. grins and re-tellings to friends about that one. keep the rawness of the work, the immediacy of it, but clean up the production a bit and these will be little gems. About the quality, I don’t mind. I’m listening to it via internet, slow stuttering connection, in London. The thing which is important, the thing I hear you realizing is: It’s WHAT people say. Any scratchyness seems to add authorship rather. If it’s rough, it must be more ‘real’, less sterilized and textual. WHEN you get the fancy Minidisc and high-tec stereo microphone, hearing these, I suspect you will still be concentrating on the person talking, not all the fancy blinking lights or high-fidelity monitoring. Growing is progressive. 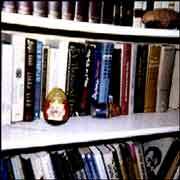 My father was a rare-book collector–mystery books. They were his pride and joy. Thanks for making me think of it. I learned how to cut plastic dust-jacket protectors from a roll so huge I could hardly move it. Flipping through rows of people’s books is like us lining our tapes or flighty minidiscs, each one a memory, a person, a song. Good use of music by the way. Even if I was smart enough to come up with this idea, I wouldn’t have pursued it. I’d be afraid they would all come out the same. These are all so remarkably different. How did you do that? There is that same question (what’s on your shelves?) and generally the same production choices (music/not hearing that much from you) but they all FEEL and SOUND different. I really like that. It speaks to how good the pieces are and how good (read natural) you are at interviewing and bringing people out. Here’s some of my fav bits from each piece. Ken: speaking about stealing the Neil Diamond songbook, "and I’m not sorry I did it." Lael: books or men? "I wouldn’t want to make that choice." You: "But what if you had to." Peter: This one’s my favorite. Music choices can be so hard to make. This is perfect. Just enough melancholy mixed with a dreamy "what if?" sense that I feel like I’m not just listening to Peter but actually AM Peter all sad and disappointed. Fav moments: "disappointing to find out that your tastes are middlebrow." AND "maybe I’m just on the reader side of the equation." Andrew: "one of her old bitty friends. Nice lady. But a bit of a crone. You mention in a couple of the pieces how well you know the people. I’m going to ask for a generality here that might not exist, but so far have you found that peoples bookshelves reveal something essential about them you already knew that sums up their character OR does it seem like examining bookshelves reveals something, perhaps both to you and the person that you’re interviewing, that you didn’t know and couldn’t have got at any other way? I know this. I wouldn’t let you come near me and my shelves. I’d be afraid of what we might find out. The thing I like about these stories is the same thing that makes them a little hard to get used to. They don’t necessarily follow customary rules of story (although they have beginnings, middles, ends). They are rhythmically different. They have more akin with portraiture than narrative. They don’t automatically fit within any existing public radio context. It’s that last point that I find most interesting. This concept has wonderful potential, and could go in hundreds of directions. These four pieces are just a small test drilling. We’re looking forward to seeing Chelsea’s "Bookcases" idea grow and find a home, or make one, and invite people over… and we’re going to try to help. Questions for Chelsea: what sort of atmosphere is at Allston-Brighton Free Radio? Is it crazy, organized, sloppy, perfectionist, creative, boring, democratic, dictatorial, anarchic? What ratio of stuff is really special? Are interesting things being born in its context? How do people there regard public radio in the same town? are any other of the Allston-Brighton crew here? Speak up. The question of placement is a good one. They’re so short, yet not short enough. I would love to hear 30 to 60sec versions of people talking about their books through the day on local stations, take that moment before the news (top and bottom of the hour) and give us a version of the story much like the jacket summery of a book. It might be refreshing to hear people taking out a book during the day (good for winter), a change from the usual babble about the obvious weather or perdictable traffic. Make every second count, like every word of a good book. The following is an attempt to answer some of Jay’s questions. As an institution Allston-Brighton Free Radio is serious and organized, particularly in terms of fundraising, programming and helping the community. But it’s different with the shows. The show I worked on was crazy, disorganized, boring, interesting. Each week it was different and that was the charm, the allure. What ratio of stuff is really special? I guess it’s all special in some sense of the word. I can say that each show is unique, they don’t sound processed and everyone works hard on them. Are interesting things being born in its context? After 9/11 I sat in on the Green Party’s show and they had a guest, a veteran from the Gulf War, who was fascinating. He said the most radical, thought provoking things. I contemplated his words for days. For many Sundays thereafter I listened to that show. It was good to hear a different perspective. I really wish that he had a larger audience because he was saying some important things. Most people at ABFR are pretty hard-core. NPR is too conservative. They tend to listen to Pacifica or college stations such as MIT’s WMBR. But there are those who felt a huge loss the day Christopher Lydon left WBUR. "The Connection," particularly when it was local, provided a much-needed outlet for everyone in the area. To Jake Warga. Street Dogs was the first thing I ever listened to on Transom. I really like your work. (I heard Jenafir a few weeks ago) Many thanks for your comments and suggestions. I like your idea of playing with the time. It will be fun to play around with the format–even to interview a number of people on the same book. It’s funny, with three people I have seen on the shelves "How to Clean Practically Anything." Okay, so long for now. I’ll tell you a secret: the Radio Rookies? Made me envious. Even while I enjoyed and appreciated their stories, a little voice kept bubbling around inside me, saying "yeah, this is great. ‘Course, they’ve got all the production gear of a major big-city radio station to play with. ‘Course, they’ve got experienced, professional producers helping them along, every step of the way." I ain’t proud of that voice, but it was there – making excuses. Here are a few more excuses: I wish I had a better mic. I wish I owned a production music library. I could do wonderful things if the nearest public radio station weren’t over 100 miles away. All right. This time I got the message: "You can have an idea and do it. No money, no decent equipment, no national distribution, no excuses." Joan Schuman is right, of course. But I’m glad the mic noise is there. I’m glad Transom recognized these pieces as brilliant and worthy in spite of the noise. Weird Al Yankovic recorded his first big hit in the men’s room of a Greyhound bus station. No excuses. Okay, I got it. I have been addicted to public radio for the last six years or so, but never considered trying it myself until this weekend. Chelsea, your bookshelf series really inspires me–you’ve come up with something really wonderful, that makes me think I could try it, too. PS I think it’s pretty cool that I am listening to the same things as someone in London. Right now I am living in Okinawa! You can truly say your work is internationally known! I do the green party show on abfree and can safely say that all of those adjectives ("crazy, organized, sloppy, perfectionist, creative, boring, democratic, dictatorial, anarchic") apply. There are so many different shows and so many different people that do them, that there is an astounding amount of variety. In general, things are pretty laid back; but, now that we have finally gotten our radio signal (1670AM) working, people are getting really serious about their shows. Most of us are pretty radical regarding mainstream media and our place as an alternative to the watered down, corporate dominated soundbite mentality that characterizes most news these days. There are shows on abfree that you would have a hard time finding anywhere else and plenty of openings for new programming. There’s something for everyone. As far as what shows are "special", I think that’s up to personal preference. Talking about this mic noise issue is important. Chelsea’s pieces are going to have a raw feeling no matter what and that’s what works about them…a radio verite. but you can have that sense of immediacy without the distraction of a low-quality microphone. you do it in the writing, in the intimacy of the interviews, in the gathering of sound. it’s all about intent. I know the intent of these pieces is to be immediate. i’m a stickler for clean sound though (that doesn’t mean "canned" sound or perfect sound or homogenized NPR sound…never, indeed). it means sound that sounds normal, as if you’re talking to a friend. it’s "live," it’s intimate and there’s no un-natural amplification of their physical movements as if they’re wearing a contact mic on their chest. there’s a time to amplify sound in an un-natural way to make a point (in sound art, in a gallery installation or a performance). it’s about intent. but this is radio and all i have is the voice and the room the person’s in. i want to hear voices and ambient sound that are clean and natural and not a jarring noise that takes me away from the intimacy of the story and says loudly, "this is a crappy mic, that’s all i have, so that’s my excuse." that said, it’s still viatally important to jump in and make radio with whatever equipment is available. if you can’t spend the money to get a decent mic, push your way into a public radio station and borrow one. "buy" one and use it and then return it (many stores will allow this for up to 30 days). it’s important to hear the difference and know when a crappy mic is an appropriate tool and when it’s a distraction. think about how a painter uses tools. He/she has the best brushes but also cheap ones to get a different visual result. mics are tools. i use them accordingly. Thanks Joan for speaking about intent and by inference, craft. When I first heard Chelsea’s peices I wrote a rant about mic handling noise and distortion in the pieces. But I discarded it because I thought I was just being a curmudeon who couldn’t dig the lo-fi aesthetic. I thought "did she leave that mic handling noise in intentionally or did she not care?" Joan is right. Intent, and awareness of the broad production pallet available to audio artists does not mean the producer has to eliminate "edge". And, as Andy Knight posted over in mics & minidiscs – used Shure SM57’s go for $50 bucks on the street ($79 new.) This mic is generally regarded as one of the 7 wonders of the audio world and is much more immune to handling noise than the plastic Kareoke mics. I agree with you about the noise. That’s the sad thing about great radio–you take it for granted. You don’t realize that it’s good because of great sound quality, great writing, great editing…it just is, it’s just there, reliable, like the moon. The noise wasn’t intentional, I wasn’t going for the "hand-held camera" effect. (That’s the sad thing about my equipment. With my earphones a lot of the time I didn’t even hear the handling noise.) I admit, however, that I was always so happy to be granted an interview, so happy to not erase or record over existing audio that the mic noise went unnoticed, by me at least. Of course coming to Transom changed this. I now know better and have put that microphone away. I do feel the need to defend those who can’t afford quality equipment, to defend any resourceful soul who just can’t access the optimal tools. sounds like nuances are happening out there at Transom and that’s great. I agree with you about limited resources. that’s why i suggested the "borrow" method, if it’s available, from any source. just hearing the differences can be ear-opening. even going into a hi-end audio store and sampling the equipment is a learning experience. then you know what’s good, what’s bad, what’s mediocre, what’s fantastic. it’s always something to work towards. but then that’s what passion’s all about. And yes, I still feel the way you do about interviewing. it is such a privilege to be invited into another’s life. and they think it’s such a privilege to be asked. symbiosis is best.